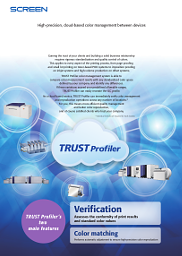 TRUST Profiler | SCREEN Graphic Solutions Co., Ltd. Gaining the trust of your clients and building a solid business relationship requires rigorous standardization and quality control of colors. This applies to every aspect of the printing process, from page proofing and small lot printing on toner-based POD systems to imposition proofing on inkjet systems and high-volume production on offset systems. TRUST Profiler color management system is able to compare color measurement results with any standardized color space defined by your company and identify any differences. If these variations exceed your predefined allowable ranges, TRUST Profiler can easily recreate the ICC profile. 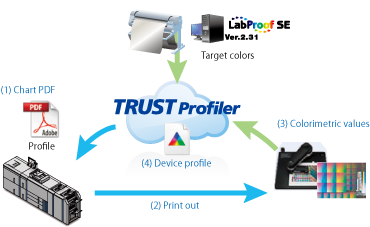 As a cloud-based service, TRUST Profiler can immediately verify color management and reproduction operations across any number of locations. * For you, this means more efficient quality management and better color reproduction, and of course satisfied clients who trust your company. * Individual licenses are required for each location. VerificationTRUST Profiler enables cloud-based assessment of whether reproduced colors conform to Japan Color, Fogra, G7 or standard colors created by individual printing companies. It can use patches output and measured on any POD or other printing system for this comparison. TRUST Profiler is also able to reference the histories of past assessment results. These features make it an extremely effective tool for the maintenance of color quality. Color matchingThe creation of specialized device link profiles allows an automatic adjustment function to perform high-precision color matching between individual devices. A process of repeated chart downloading, printing, measurement and uploading is then used to achieve even higher levels of color matching accuracy. Profile creation is also possible for colorimeters other than those listed above. Measurement results should be saved to files and uploaded to the TRUST Profiler Web server. 1. Functions such as hibernation, standby or sleep modes should be turned off. If these functions are on, the TRUST Profiler session times out after a preset period and users are automatically logged out. 2. Each time TRUST Profiler is launched, it runs a check for the required plugins. If a plugin is not found, TRUST Profiler installs it automatically. TRUST Profiler also checks for updates to the measurement plugin at the same time. If a newer version is available, TRUST Profiler updates the plugin automatically.